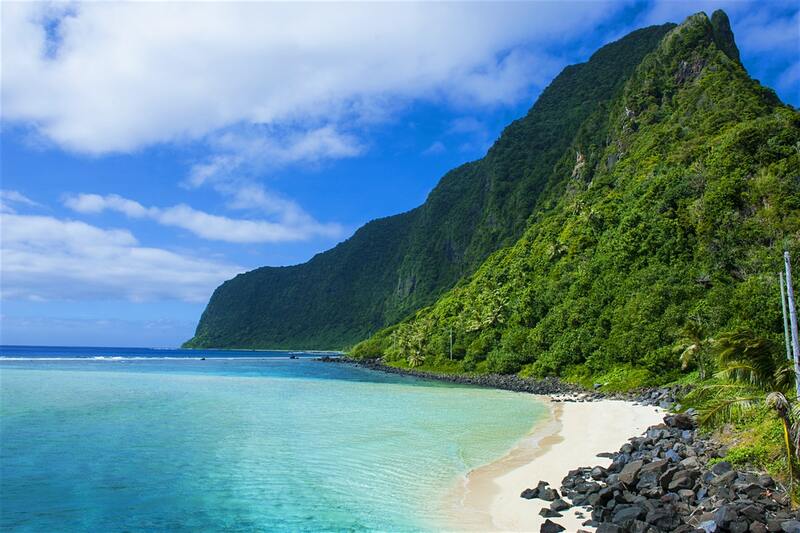 When thinking of pristine beaches in the Pacific Islands, many of you will think of Fiji, Aitutaki and Rarotonga, however 4 hours northeast of Auckland is a hidden gem – Samoa. I was lucky enough to be sent on an educational earlier this year to see all of what Samoa has to offer, and was I impressed. If you are thinking of authentic, relaxation, beauty and a time a lot slower than ours, Samoa is the place for you. My first stop was the biggest island of Samoa called Savii. This island has the clearest tranquil waters I have ever seen in my life. It was breath taking nature at its finest. To get to this quiet slice of paradise two ferries are offered daily which depart from Upolu ferry terminal, about 10 minutes’ drive from the airport. The conditions of the boat are basic and you really get your first feel of what life is like in the laid-back Samoan culture. On arrival to Savii there are big buses you can catch, scooters to hire and lots of foot traffic. Once you are in Savii there are so many natural sights to visit. My first stop were the blow holes. Not only is it a sight to see massive amounts of water being blown out of rocks you are standing on but to add to this experience we got to watch one of the local ladies praying to the sea gods in an airy song like way to encourage the water to blow up for us to see, she continued with her song whist throwing coconut skins into the blow holes. When the water blew up this caused the coconut to be shot meters into the air – amazing all of the tourist with how powerful the blowholes really were. After spending a night in Savii it was back to the main island of Upolu. 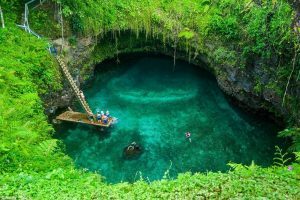 There are two islands in Samoa, and as mentioned above Savii is the biggest island of the two, however Upolu is the more populated island and is what more people commonly think of as Samoa when visiting. 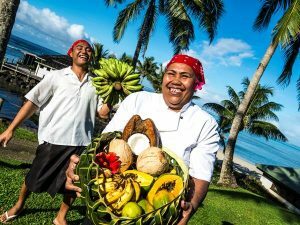 I was told by locals and believe it myself after visiting – you don’t see the real Samoa unless you visit Savii too. On Upolu there is lots to see and do. One highlight was getting to visit the To Sua Ocean trench. 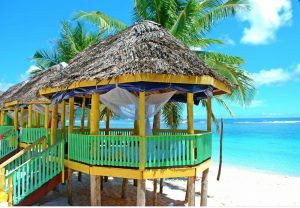 This is commonly seen in photos and advertising of Samoa. It is a massive ocean trench with a ladder leading down to the waterhole below. This is spectacular and surprisingly in the middle of a big lawn. Not far from here is the stunning beaches of Lalomanu. These beaches are on the southeastern side of Upou glistening with golden sand and water so blue. When thinking of a tropical island I truly believe Samoa fits the bill. 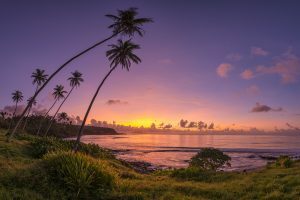 Upolu offers nature and history. I visited the Robert Louis Stevenson Museum, now I didn’t know who this was but learnt a lot about this famous writer and his life after going through his museum. This museum is located not far from Apia – the main town in Upolu and is based in the massive house Robert Louis Stevenson got built for him and his family after he immigrated due to sickness. On the opposing end to a Scotsman living in the islands is the traditional village located in Apia. This is a mock village with demonstrations of a handful of Samoan ways of life. Here we got welcomed with a Kava Ceremony witnessing what happens in real life situations. From the chief of the tribe welcoming everyone to the sharing of Kava. After this we were able to venture around and witness tradition tattooing (which I may, seems extremely painful), to wood caving and tapa cloth making. There really is so much to see and do and so much to learn within Samoa.